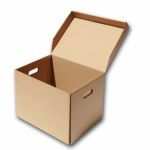 Our cardboard storage boxes with hinged lids provide an ideal solution in managing and storing your records and files. The corrugated storage boxes will keep your documents safe while keeping them clean and dust-free. Supplied with hand-holes, the single walled storage boxes are easy and comfortable to handle. Made of strong and sturdy high-quality materials, our document storage boxes offer an excellent protection for your valuables during transport or while in storage. They can be stacked (the weight of your contents may limit how many you can stack), are 100% recyclable and made of 100% biodegradable materials. They are supplied to you flat for quick and easy assembly. The really useful storage boxes with hinged lids come in one size 400 x 325 x 254mm. Our warning tapes are a perfect if your items are fragile or our general adhesive tapes are good and economical. Our adhesive coloured tapes are great for colour coding your contents. Storing and managing your files are made easier and manageable with our cardboard storage boxes with hinged lids. Keeping your documents safe, clean, and dust-free, the cheap archive boxes have hand-holes that will allow easy and comfortable carrying. Our document storage boxes, sit perfectly on racking or allow easy stacking (subject to the weight of your contents). Should your items be fragile please look at our extensive range of void fill packaging solutions. They are great for general storage, office filing, and archiving.